Ethanoic acid; Ethylic acid; Methane carboxylic acid; Pyroligenous acid. · They are weaker in action locally. · They are better absorbed into the systemic circulation, and therefore have more powerful remote action. Colourless, volatile liquid with a characteristic pungent odour. At 100C to 150C, the acid occurs in crystalline form (glacial acetic acid). · 60% solution: printing, dyeing, plastics, and rayon manu-facturing, hat making. · 6 to 40% solution: disinfectant, pharmaceuticals, hair wave neutraliser. 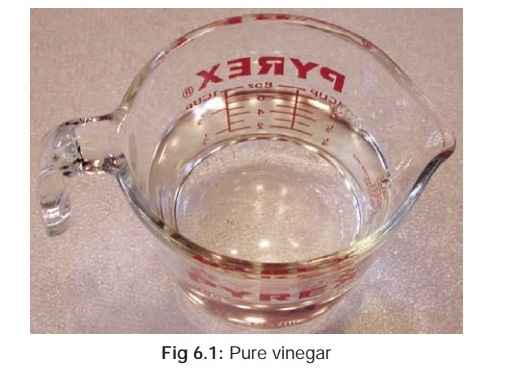 · 4 to 5% solution: vinegar (Fig 6.1). About 50 to 100 ml of concentrate acetic acid. In concentrated form, acetic acid is a corrosive (albeit mild), while in dilute form it acts as an irritant. Systemic absorption leads to haemolysis, haemoglobinuria, and renal failure. · Local effects: Mild grey-brown corrosion with concen-trated acid. Chronic exposure to fumes causes darkening of skin. · Ingestion: Pain, haematemesis, haemolysis, diarrhoea,disseminated intravascular coagulation, and renal failure (Table 6.1 lists some common nephrotoxic poisons). · Inhalation: Bronchopneumonia, pulmonary oedema.Chronic exposure leads to erosion of front teeth, chronic rhinitis, pharyngitis, and bronchitis. · Odour of vinegar in the vicinity of the patient. · When a small quantity of stomach contents is gently heated with ethyl alcohol and 1 drop of sulfuric acid, there is emanation of a fruity odour. This is on general lines, with special attention paid to correction of acidosis and renal damage. Stomach wash can be done with caution if the patient is seen early. · Odour of vinegar around the mouth and in the gastric contents. · The affected areas of skin and mucosa may be greyish brown. Viscera meant for chemical analysis must not be preserved with rectified spirit. Saturated saline should be used instead. · Most cases of poisoning are accidental. There are however occasional reported cases of suicide. It is pertinent to mention here that if paraldehyde meant for therapeutic use is stored improperly (e.g. in badly stoppered, transparent glass containers), it degrades into acetic acid with resultant iatrogenic poisoning when administered to a patient.